Chris Bailey, a former USA cycling athlete, knows a lot about fueling his body during rigorous exercise. Now he’s a partner in Vermont Smoke and Cure, a Hinesburg, Vt., smokehouse producing uncured ham, bacon, and sausages made from local, naturally raised beef and pork. 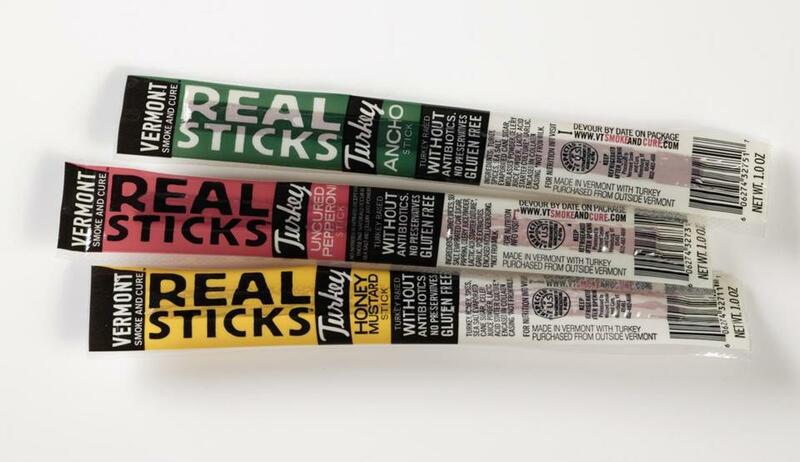 Tinkering with ways to make a healthy, high-protein snack, Bailey came up with RealSticks, a line of preserved meat sticks ($1.59 for 1 ounce), which are nitrate-free, low in salt and fat, and made with real spices. The moist, slender beefy snack is offered in cracked pepper, barbecue, and chipotle flavors. Last year the company rolled out Turkey RealSticks in honey mustard, ancho, and spicy pepperoni; the texture is lighter but flavors pack a punch. Munch any time of day, especially after a workout; stash some in the gym bag. RealSticks are available at Roche Bros. supermarket locations. Turkey RealSticks are available at Fort Point Market, 369 Congress St., Boston, 617-426-9988; Harvest Co-op Markets, 580 Massachusetts Ave., Cambridge, 617-661-1580, 57 South St., Jamaica Plain, 617-514-1667, and 3815 Washington St., Jamaica Plain, 617-405-5300 or go to www.vtsmokeandcure.com.